A crafty schoolgirl’s plan to get out of school for a few days massively backfired when she didn’t quite think it through. Little rascal Lily Schooley, six, had noticed some of her friends taking days off for chicken pox and decided to try her luck. So, after a tiring day at school last week, Lily borrowed a red – permanent – Sharpie to ‘do her homework’. 10 minutes later she ran downstairs to complain to her parents about her new rash – which had come on rather quickly. Quick-thinking mum Charlotte was, however, wise to her daughter’s ways, and instead of admitting she knew what was going on, said they’d better go to the doctors right away. Not wanting to go to the doctors, Lily ran upstairs to try and wash off the spots, though she was soon forced to admit to her parents what she’d done when the permanent marker wouldn’t wipe off. Even her mum’s own attempts with body wash, soap, baby oil and eventually hairspray wouldn’t shift them. Instead, mortified Lily was left trying to convince pals she wasn’t infectious when she was forced to wear shorts and t-shirt in PE the next day – revealing the prominent red spots. The house is always full of laughter with Lily. She is very witty. She had a spelling test the next day that she didn’t want to do. 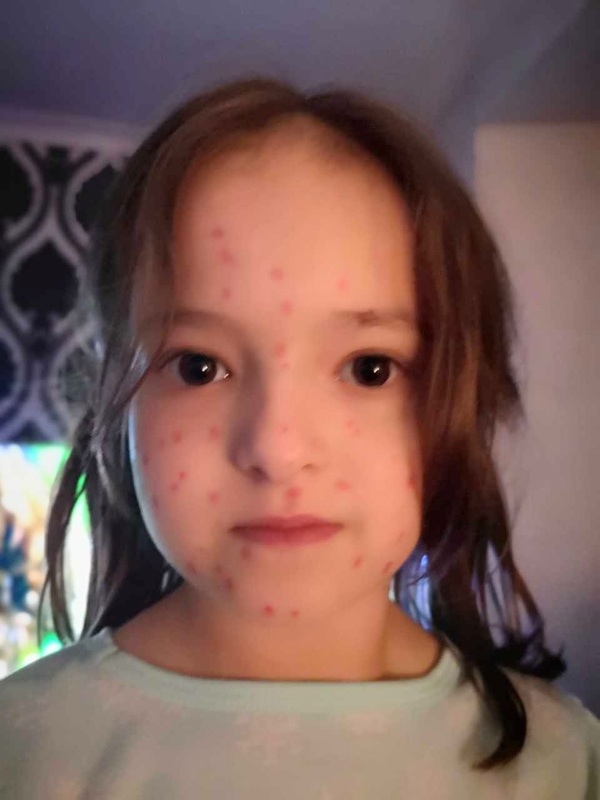 A few of the children in school had come down with chicken pox and she’s had it before so she know she stayed off school for a while. She came down and said ‘I just need a red pen Mummy, I need to do my homework’. Then she came down 10 minutes later and she was stroking her arm. She said ‘oh mummy, I’m feeling a bit itchy. I’ve think I’ve got a rash’. We turned the light on and she was absolutely covered in it. Me and my husband were aching with laughter, trying not to let on that we knew. I asked what the matter was and she said ‘I think I’ve got chicken pox, I can’t go to school’. She’d been sat on the bathroom floor drawing dots on herself. The schoolgirl was hoping for a day off, but instead ended up having to go back still covered in the red spots she’d drawn on herself. We had to send her in with a letter the next day to say they weren’t contagious or real and we just couldn’t get them off. Everyone was looking at her like she was contagious. We had to tell everyone she wasn’t. She had PE that day as well and had to wear shorts and t-shirts. The teachers thought it was hilarious. Better luck next time, Lily!